When I first read about Drink & Learn history and cocktail classes with cocktail historian Elizabeth Pearce, it occurred to me that I might have missed the boat on a brilliant business idea. Held at the luxe, light-flooded Empire Bar at Broussard’s in the French Quarter, this two-hour class begins with a refreshing cocktail made with lemonade, maraschino liqueur and crème de noyaux. Dubbed the Master Lemonadier, the drink is expertly crafted by New Orleans’ favorite cantankerous master bartender Paul Gustings. Many locals know Gustings from his stints at Napoleon House and Tujague’s. We move on to a boozy second cocktail, the original Sazerac, made with cognac, Peychaud’s Bitters and Herbsaint. An animated Pearce tells us the story behind the New Orleanian who invented the anise-flavored liquor Herbsaint as an alternative to the then-outlawed absinthe, and how during Prohibition he cleverly became a pharmacist, prescribing alcohol as a healing elixir. She instructs us to sip slowly, so we can compare and contrast with the next drink, the modern version of a Sazerac, which employs rye or American whiskey. Throughout the class, Pearce stands in front of an LCD monitor flipping through historic photos, newspaper clippings and videos. From start to finish, the experience features the history of New Orleans from its founding by the French in 1718, through its veritable avoidance of prohibition all the way up to … um, it gets a little hazy, so I’ll have to consult my notes … OK, my notes are slightly incomprehensible scribbles; so let’s talk about Pearce and her credentials for a moment while I try to jog my memory and decipher these notes. A former curator at the Southern Food and Beverage Museum, and co-author of The French Quarter Drinking Companion, Pearce started Drink & Learn cocktail tours in 2012. 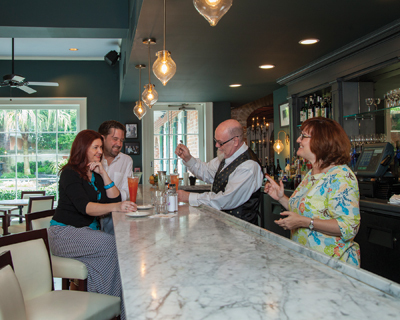 “The Cocktail Tour,” also $50 per person, winds through the French Quarter with stops at the Pharmacy Museum, Jackson Square, St. Louis Cathedral and the Port of New Orleans, while participants sip a St. Charles Hotel Punch, Sazerac, Hurricane and Praline Liquor. Pearce tells us during the 20-ish minute intermission that she started “The New Orleans Experience,” at Broussard’s in ’13, as a way to tell additional and different stories than she offers in the tour, and also have an alternative class during hot summers and for those not keen on pounding the pavement, albeit at a leisurely pace and with tasty beverages. After the break, we are lead to the punch bowl to sip a healthy pour of St. Charles Hotel Punch, which combines sugar, lemon juice, ruby port, Cognac and orange curacao. I have managed to translate my tipsily scrawled notes and if they’re accurate, it seems at this point Pearce wows us with stories of the grand hotel, the history of punch and how a drunken nation finally came to the age of cocktails. We are now a drunken nation of two and before wobbling out onto Conti Street to hail a cab, we slurp down the most deeeeleeshous and furtafizing coattail … hiccup … of zthe dayz, a Ramosh Gem Furz [Ed. note: Ramos Gin Fizz]. Drink & Learn, 578-8280, DrinkAndLearn.com (Pearce is offering New Orleans Magazine readers $5 off each ticket with the promo code, NOLAMAG).